A new product added to my range recently, features 5 glossy pin badges that are each 1 inch (2.5cm) in diameter. 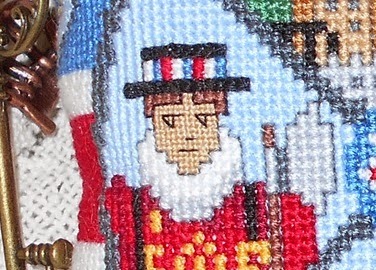 Four of the badges feature miniature versions of my festive cross stitch designs and the fifth badge shows my logo. I have had a few requests from customers asking for projects which would incorporate these badges, so I am offering some project ideas here - but of course, there are plenty more used for these little badges, such as pinning them to bags, adding them the centre of one of my mini cushion designs (they fit perfectly in the central circle!) or simply pinning them to your clothes. As an added little gift for friends and family, make little name cards for your dinner table and attach a badge to each. For each person, cut a piece of thin card 9cm x 6cm and fold in half lengthways. Cut an upside-down V as shown in the photo below and you can then hook the badge over the ^ and your guest can take the badge with them as a little memento. Buy some brown parcel tags, or make your own from card, then cut small rectangles of felt in co-ordinating colours to the badges. Pin the badge to the felt, then use double-sided sticky tape to stick the felt to the tag. A tag and a gift in one! To combine cross stitch with these little badges I have designed this set of four hanging decorations for your tree. 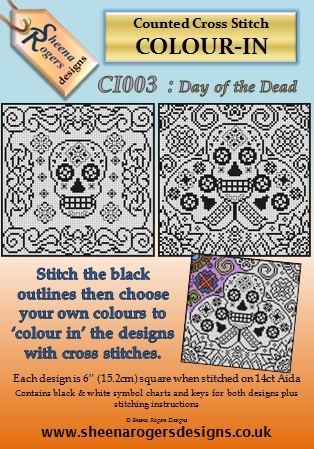 Cross stitch each square onto pieces of 14ct aida that are approx. 4" (10cm) square using 2 strands of DMC stranded cotton as per the charts and key below. Take your backing fabric and place face down onto the front of your stitching and sew the two pieces together all around the edge of the design, being sure to leave a gap in the last edge for turning inside out, and also remember to make a little loop for hanging the decoration and be sure to sandwich this between the two pieces of fabric at one corner. Turn inside out a fill lightly with soft toy stuffing, then close up the gap with neat stitches. Carefully pin the badge into the centre of the decoration. (To print off a full-size version of this chart, right click on the picture then 'copy image'. Open up Microsoft Paint (or other basic package) into which you can copy the image, then print to your preferred settings). While perusing the magazine aisles in my local WHSmith (you'll find me in there a lot!! ), I came across a crochet magazine which had a free gift on the cover of a pom-pom maker. I had seen these nifty little gadgets used by Kirstie Allsopp on one of her craft programmes and thought they looked really clever, so I bought the magazine and tried it out. I can't believe how much easier it is to make these pom-poms now! I keep looking at things now wondering how much better they might be with some pom-poms attached! Having bought the crochet magazine I naturally read through all the loveliness inside, and it 'hooked' me. I had tried crochet many (many) years back and looking at the modern styles and bright colours I thought I'd give it another go. I rooted around my cupboards (a common practice for me!) and found the Ladybird book that I taught myself to crochet from all those years ago. I'm left-handed but I managed to teach myself to crochet as a right-handed person - don't ask me how! I also found some odd bits of wool (I'm so grateful to be a hoarder at times), and with my trusty hook I started making some good old Granny Squares. But I couldn't stop there and had to create something else, so I bought a cheap pack of different coloured wool balls in The Range and made this crochet cushion (a full size one too!). And of course, I just had to add some pom-poms made with my new pom-pom maker too. So now, when my eyes get a little too tired for cross stitching at night, I pick up my hook and crochet! After having combined two hobbies in one with my 'colour in and cross stitch' designs, I had an idea to combine another hobby with cross stitch - and my new-found love of crochet was where the idea to create my cross stitch crochet designs came from. 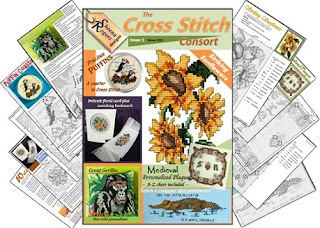 I wanted to create the cross stitch designs so that they gave the illusion of having been produced using crochet, so I needed to study how the light caught the wool crochet stitches and tried to re-produce that effect in cross stitch. From the crochet magazine I could see that something called a 'Mandala' seemed to be a popular project for crocheters to work one. 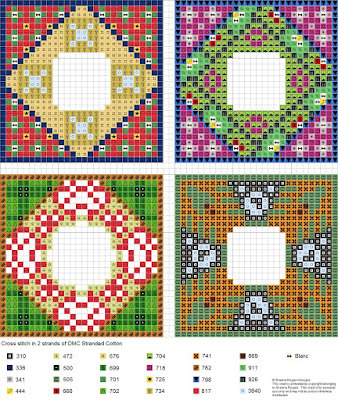 These are round designs, made up of rows of different colours and usually, different stitches - an ideal subject to use for creating a vibrant cross stitch mini cushion. When I was cross stitching my Crochet Mandala design, I worked each 'round' of colour in turn from the middle, starting with the blue, then the red, then yellow and so on, just as I would if I was working the design in crochet, which made me feel as if I had really combined the two crafts together. Of course, I had to create a mini cushion design using the trusty Granny Squares pattern and I added some little hook motifs around the design, and as these squares are usually stitched together to make larger blankets I created my own miniature versions of them around the sides of the design. And to complete the set, I designed a matching Granny Square Pincushion too - which could also be used to hold those darning needles used for weaving in those loose ends in crochet. If I had the time, I would love to produce a full-size cushion in cross stitch by repeating this Granny Square design and swapping the colours around. I'm wondering now what other new hobby I can discover to combine with cross stitch to create more designs - watch this space! Well, this year has just flown by. There have been mini cushion designs galore, magazine commissions and some surprises along the way! My 'colour-in and cross stitch' designs were a particular highlight of the year for me, as they gave me the chance to just hang loose with my designing and create whatever took my fancy, experimenting with different colour variations within the black outlines. 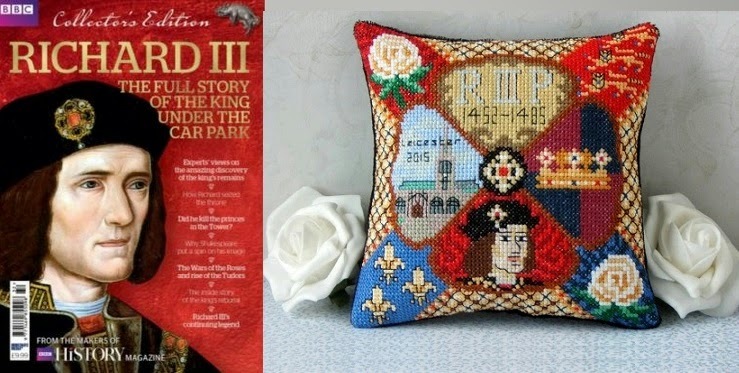 The year has seen the end of the popular TV drama series Downton Abbey, so what more fitting way of a send off was there than to design a few mini cushions of the characters. 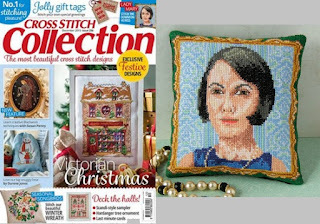 Cross Stitch Collection commissioned a Lady Mary design from me to accompany my Mr Carson mini bust, both of which were published in the magazine. I'm looking forward to further exciting magazine commissions in 2016 too. This year I've built up my Etsy shop by adding more of my products to it, so there are more avenues for customers to choose from as I have my main website, this Etsy shop and also listings on ebay. Christmas is always my favourite occasion to create mini cushion designs for and I produce at least one design each year. But this year, I designed three mini cushions plus two hanging decorations - I just couldn't stop myself! As my Christmas Village design was so popular from the previous year, I revisited the village theme and produced a new scene, titled Christmas Eve. Then I found some Christmas berries in a gift shop and they inspired my 2nd design of Festive Flowers. 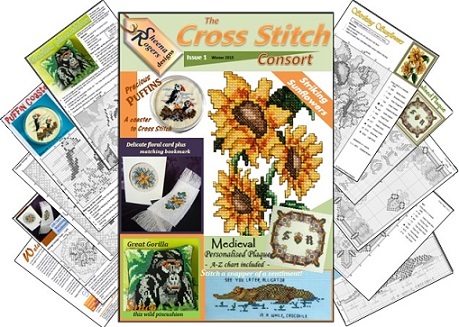 The latter part of 2015 also saw the launch of the first issue of my 'Cross Stitch Consort' magazine. It takes the form of an electronic PDF file, containing a mixture of charts for designs that don't really fit my kit collections. In addition to releasing even more mini cushion designs in 2016, I'm also planning to release more of these 'magazines' too as I have quite a selection of random designs to choose from. Finally, all that's left for me to say this year is to thank you for your continued support and friendship, and I wish you and your families a very Merry and Peaceful Christmas and a Happy and Healthy New Year. I carried out some of my own research into the history behind the blue and white pattern found on pottery/porcelain that was popular in the 18th century and is experiencing a comeback in modern times. Once upon a time there was a Mandarin who had a beautiful daughter named Koong-se and they lived in a palace with a beautiful garden. The Mandarin employed a secretary, named Chang, who fell in love with Koong-se, much to the anger of the Mandarin. Chang was considered to be unworthy of the Mandarin's daughter and was banished from the palace. The Mandarin built a fence around the gardens so that Koong-se and Chang could not meet. Koong-se was soon dismayed to learn that her father had announced she was to be married to a nobel warrior called Ta-jin. She was full of despair when she heard that Ta-jin was arriving, for she did not love Ta-jin. Her love was only for Chang. Chang heard of the engagement and he stole into the palace during a banquet, dressed as a servant and made his way to Koong-se's room. They embraced and vowed to run away together. The couple ran from the palace but as they were crossing the bridge, Koong-se's father saw her at the last minute and gave chase. The couple escaped and hid in the house of Koong-se's maid, but the Mandarin's spies had followed them. The spies reported to the Mandarin that a man was hiding in the house by the river and the Mandarin ordered his guards to raid the house. During the raid, Chang had jumped into the raging torrent and Koong-se thought her one true love had drowned. But Chang was to return, bringing a boat to the window and he took Koong-se away to safety. The couple settled on a distant island and over the years Chang became a famous writer. This was to be their undoing however, as the Mandarin heard of Chang's success and sent his guards to kill him. Chang was put to the sword and a heartbroken Koong-se set fire to their house while she remained inside. The gods, touched by their love, felt sorry for their plight and immortalised them as two doves to fly in the sky together forever. 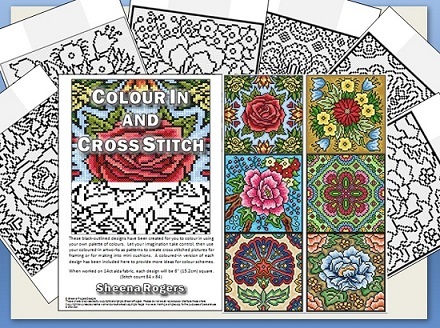 My local bookshops and newsagents seem to be full of colouring-in books aimed at adults. This is the new craze that appears to be growing and providing a therapeutic and creative release for stress. 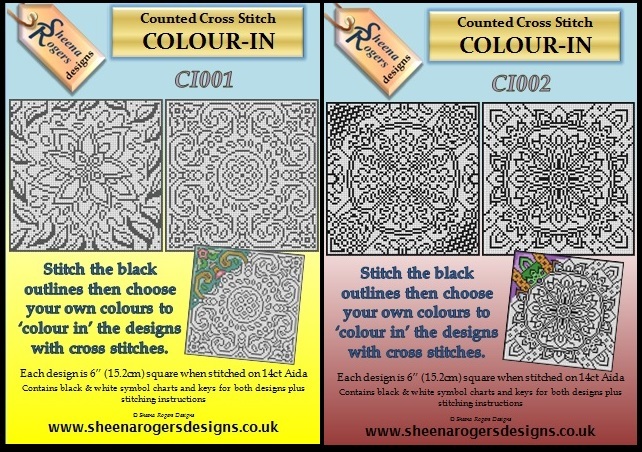 On social media there is a growing number of cross stitchers who are finding the joy of colouring-in for themselves, so this gave me the idea of combining the two hobbies and my new 'Colour-In Cross Stitch' chart packs were born! 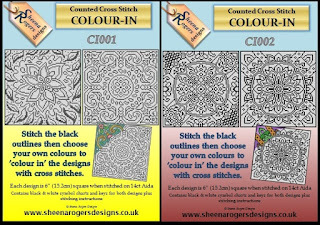 I've created a range of 6" square designs made from black cross-stitched outlines (and some include thinner, backstitched details too), and the aim is for the charts to be coloured-in by the stitcher and then the design can be cross-stitched onto fabric using colours that the stitcher already has in their stash. (Because if any stitcher is like me, they'll have A LOT of threads in their crafting stash!). I really enjoyed designing my stained glass-style designs in the past and working on these is just like that again which makes it a joy to do. I'm now planning to design more of these pieces - a project that I might take up is to create enough designs to put forward for collating into a 'colouring cross stitch' book, who knows? And in between these black and white designs, I'm still creating mini cushions - working my way through my list of themes. At the moment, I'm designing a mini cushion with an ancient Greece theme. I had always planned to create one like this after I was given a small Greek 'urn' some years ago, and I raided my cupboards to find an old Reader's Digest book all about the country with some great photos included. Although I keep producing these designs, my 'to-do' list doesn't seem to be shrinking! I can't keep up with them as I keep adding more! But at least it keeps things busy and interesting. Still residing in roughly the same period as Richard III, but in the different setting of Mexico, comes my new mini cushion design based on the Ancient Aztecs which will be available soon. 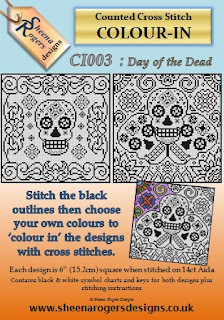 This one is in the stitching phase and is full of bright colours - a lovely companion piece to my Day of the Dead design I think. In the past I had received a few requests to design an Owl-themed mini cushion, so I added it to my 'to-do' list for when the idea took hold. Recently I've noticed many stitchers have been working on Owl designs, either realistic versions or 'patchwork' type designs, which made the Owl subject rise up on my list. I wanted to produce a design which featured realistic versions of Owl rather than the stylised, almost cartoon, versions that I've seen of late so I reached for my Bird encyclopedia and carried out some research online of the different breeds of Owl. 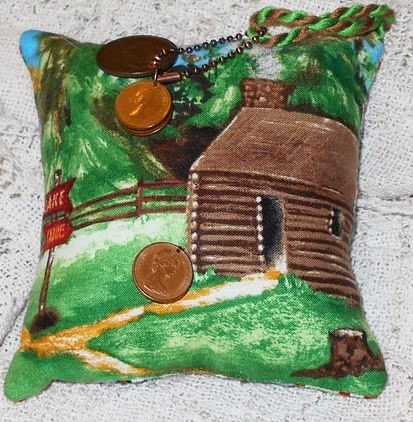 I was recently contacted by a lovely lady from the US who has purchased several of my designs and has shown me her unique ways of finishing her mini cushions. Her name is Judy and I just had to show you her lovely work here. 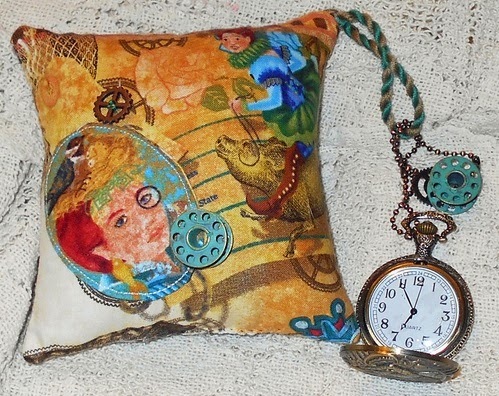 Judy loves to add extra embellishments to the finished mini cushions by attaching little trinkets, such as coins or a pocket watch, and she also chooses backing fabrics that feature designs to match the theme of the mini cushions. 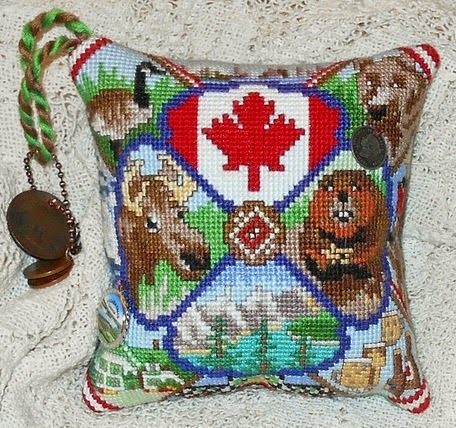 First, we have the Oh, Canada design with coins attached and Judy has selected a lovely backing fabric to complement this design. 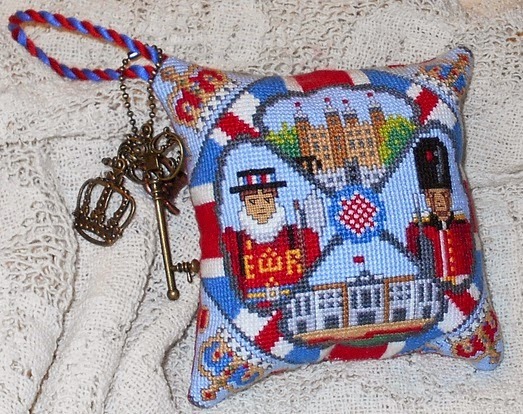 Next, we have A Mini Tour of London, and Judy has added a little selection of metal trinkets to this one, including a crown and key. Even thought has gone into the cord loop in the corner, with colours to match the design. 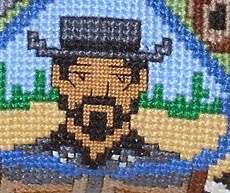 Something else that Judy does to the designs to make them more unique is to stitch the faces in petit point. I love the detailed effect and added texture this brings to the mini cushion. 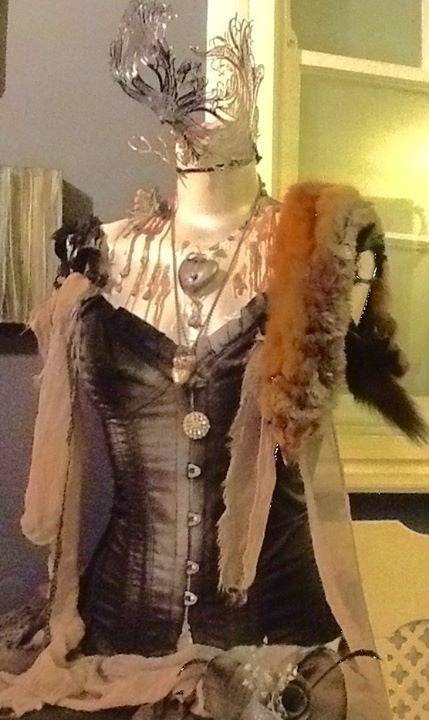 Although I love all of the finishes, I think my favourite has to be the Steampunk design. Those cogs and the pocket watch just set it off a treat. And the inspired backing fabric must make it difficult to choose on which side to display the finished piece! I find it a compliment that my designs have inspired Judy to create these unique pieces, which are certain to remain as heirlooms for years to come, and I thank her for agreeing to share these pictures with all of us. 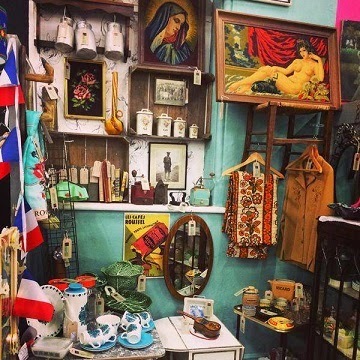 At the weekend I discovered an Aladdin's Cave of treasures on the other side of Ramsgate (my hometown), known as the Petticoat Lane Emporium. 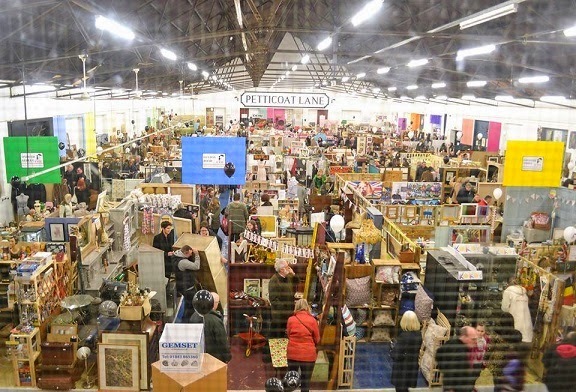 It had only been open for a week and there were 170 traders in a 15,000 sq ft building, selling antique and vintage crafts, homewares, clothing or furniture. 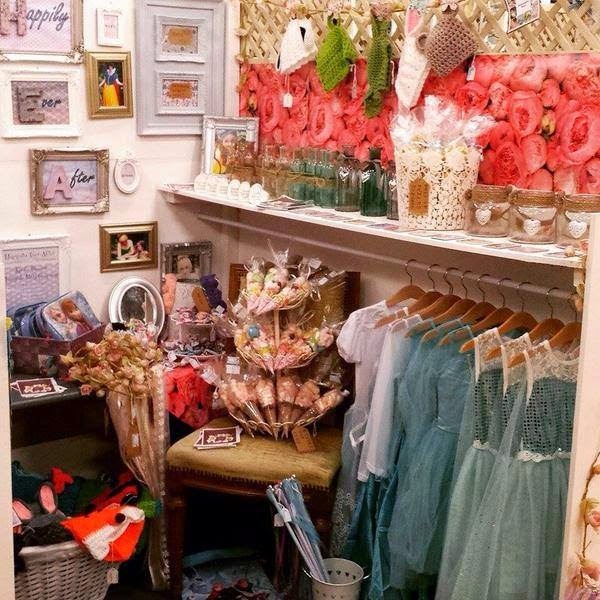 It's open 7 days a week and I spent a couple of hours there wandering the aisles and seeking out little jems of gifts and ideas. 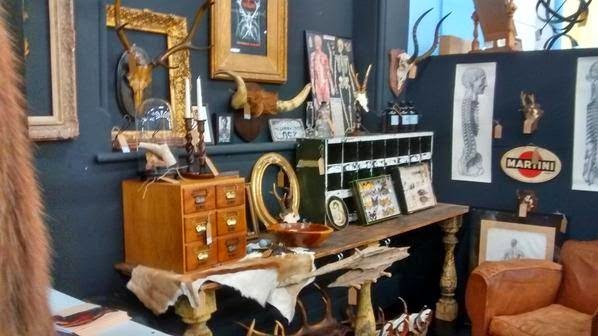 Each trader has a small section of the room in which they set up a lovely scene to show off their wares and you can tell each one has put a lot of thought into it. I could just picture several of my mini cushions nestling into each one as I went around as there were styles ranging from the '20s to '80s. 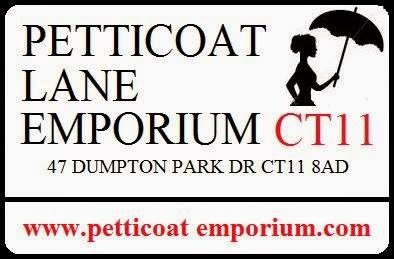 Well, that was a quick snapshot of my visit to the Petticoat Lane Emporium and I'm sure there'll be many more visits to come. I've picked up lots of ideas for new mini cushion designs and I'll probably have to venture back there to pick up some bits and pieces to act as props in the photos of my finished mini cushions. If you want to step back in time, pay the Emporium a visit. 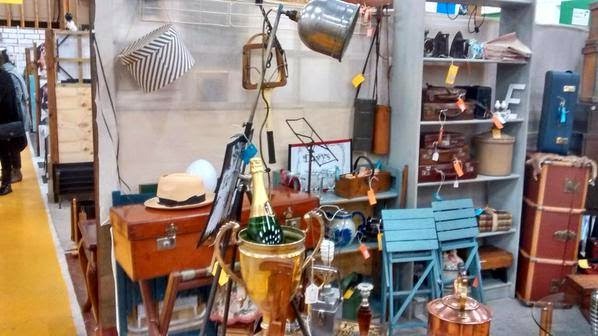 There'll be things to trigger memories and things to tempt you into buying them - you know you want to! 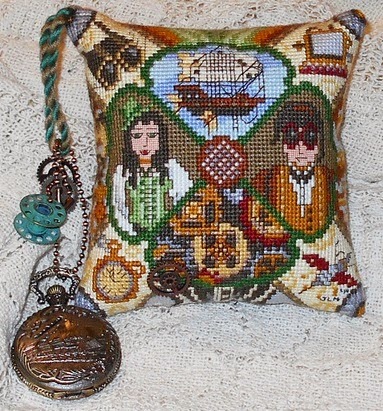 I have two mini cushion designs in the stitching phase. One is a '70s style design and the other is.....a secret for now! I've finished designing an Owl themed mini cushion (again, this one has been requested several times), and also an Easter hanging decoration. I have an Aztec-themed mini cushion waiting to be stitched too. I'd better get on with it all now so I shall sign off until next time.